Singapore, 19 November 2012 – MSIG, a part of Mitsui Sumitomo Insurance Company Limited (“MSI”) within the MS&AD Insurance Group (“MS&AD”) -- one of the largest general insurance groups in the world, today launched a new brand campaign in the region. MSIG’s campaign aims to reinforce its commitment to active and sincere service, building a long-term perspective, and developing a stronger emotional connection between its customers and its insurance solutions. This campaign serves to differentiate MSIG strongly in a sector that traditionally focuses on short-term protection of objects and risks. Rolling out across Asia in five markets, the integrated campaign will see print, television, outdoor and digital advertising kick off in Indonesia, Singapore and Malaysia from November, with Hong Kong and Thailand rolling out the campaign next year. 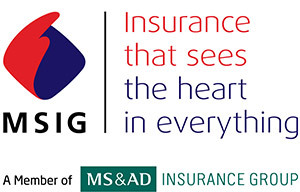 The “Insurance that sees the heart in everything” message was created to communicate MSIG’s spirit in going above and beyond for its customers, as the company understands the basic, emotional motivation behind every general insurance purchase. Through its market research, MSIG found that while its customers perceive general insurance as short-term in nature, customers want to feel that the things they insure are valued by general insurers who show empathy when meeting and servicing their needs. ‘Seeing the heart in everything’ communicates our philosophy and spirit of ‘going above and beyond’, which is an integral part of MSIG’s corporate character. At our core, we seek to understand the motivation behind our client's purchase of general insurance. We view what is insured with us not merely as objects, but represent and define the emotions and aspirations of our customers,” said Mr Alan Wilson Regional CEO of MSIG Holdings (Asia) Pte Ltd. Combining global and local best practices, the core subsidiaries and affiliates of MSIG Holdings (Asia) Pte. Ltd. across ASEAN and Hong Kong (“MSIG”) have been providing general insurance solutions for more than 100 years. As an established leading insurer with a long-term perspective, MSIG aims to offer insurance solutions that are effective, efficient and simple to understand; delivered with active and sincere service. MSIG is backed by the solid foundation and rich heritage of Mitsui Sumitomo Insurance Company, Limited, an established insurer that has received strong financial ratings from leading rating agencies, including Standard & Poor’s and Moody’s. Located in Singapore, MSIG Holdings (Asia) Pte Ltd (“MSIG Asia”) is the regional holding company and a subsidiary of Mitsui Sumitomo Insurance Company, Limited within the MS&AD Insurance Group. MSIG Asia is helmed by Chairman, Mr Noriaki Hamanaka, and Regional Chief Executive Officer, Mr Alan J. Wilson. MSI was formed in October 2001 through a merger between the former Mitsui Marine & Fire Insurance Co., Ltd.("Mitsui Marine") and the former The Sumitomo Marine & Fire Insurance Co., Ltd. ("Sumitomo Marine"). Mitsui Marine and Sumitomo Marine were leading non-life insurance companies boasting long histories, having been established in 1918 and 1893, respectively. Awarded ‘General Insurance Company of the Year’ by the Asia Insurance Review in 2011, MS&AD was formed in April 2010 from the business integration of the Mitsui Sumitomo Insurance Group Holdings, Inc., Aioi Insurance Co. Ltd., and Nissay Dowa General Insurance Company Co., Ltd. Today MS&AD is one of the largest general insurance groups in the world with presence in over 40 countries and regions, 17 of which are in Asia. Based in Japan, MS&AD is active in five business domains, namely domestic (Japanese) non-life insurance, domestic (Japanese) life insurance, overseas business, financial services business and risk-related business.